Now the Lord had said to Moses in Midian, “Go back to Egypt, for all the men who wanted to kill you are dead.” So Moses took his wife and sons, put them on a donkey and started back to Egypt. And he took the staff of God in his hand. Early morning, just before sun rise. The rising sun, which is still below the horizon, behind the figures, illuminates this scene. Cast shadows from the sunshine coming off the clouds radiate towards the viewer. 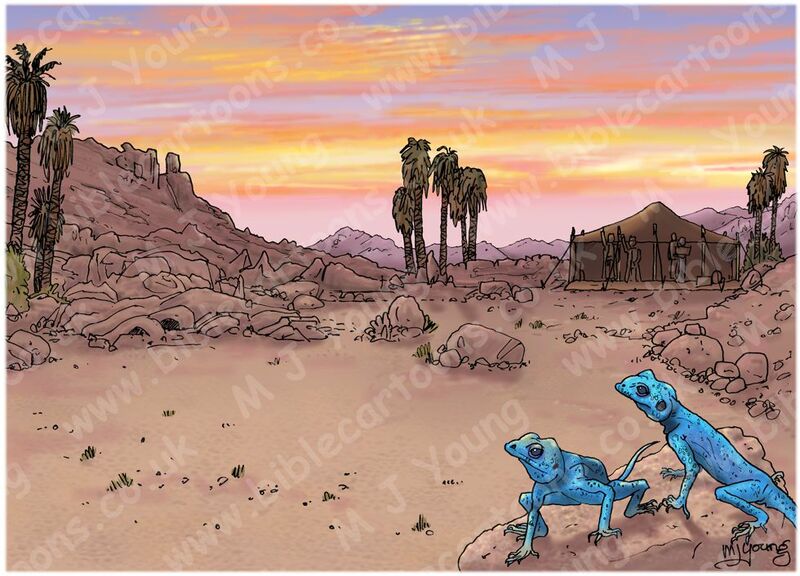 From left to right: Zipporah (Moses’ wife) is waving to her family at the tent in the background. 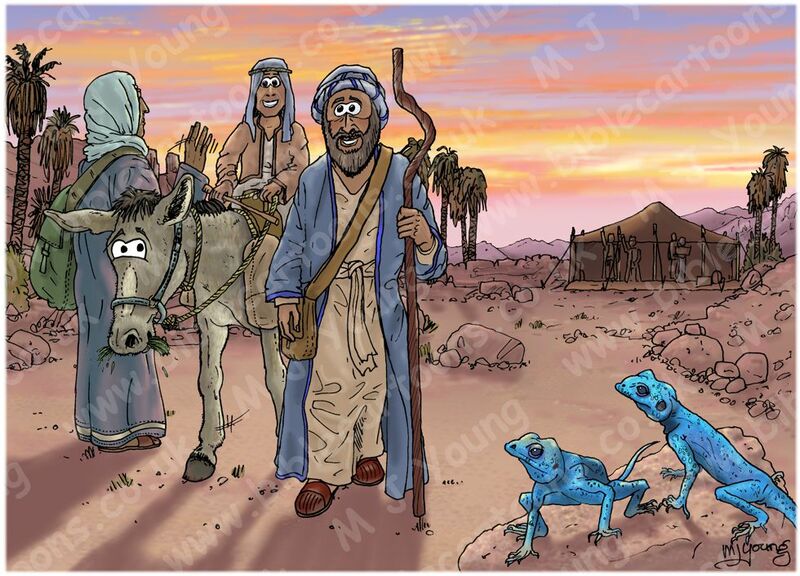 Gershom (Moses and Zipporah’s first son) is riding on a donkey, Moses is walking towards the viewer. I was very pleased with the landscape and sunrise cloud effects achieved in this scene. The cast shadows add drama to the beginning of Moses and his family’s early morning trek, back to Egypt. 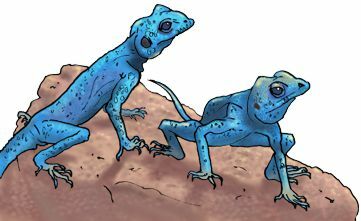 I enjoyed drawing the two blue, male Sinai agama lizards, standing on a rock in the foreground, watching the small family party leaving for Egypt. In case you’re wondering what the landscape looks like without the figures, here it is! Exodus 4:20 tells us that Moses had “sons”, not “a son”. Although only one son (Gershom) had been mentioned in the initial account of Moses’ marriage to Zipporah (Exodus 2:21-22), clearly Moses second son Eliezer had been born during Moses’ forty-year stay in Midian. This being the case I have drawn Zipporah carrying a large bag-like piece of luggage over her shoulder. Although we can not see it, it is in fact a carry bag for her newly born son Eliezer. There is no biblical account of when Zipporah and her two sons returned to her father (Jethro (aka Reuel)) from Egypt. Many Bible commentators think that Moses sent his family back for safety, although some believe the circumcision incident (see the next scene) may have caused an argument/tension between Moses and his wife Zipporah, and they suggest she may have returned to her father in Midian after she, Moses and her children eventually reached Egypt. After Zipporah leaves Moses, we have the confrontation between Moses and Pharaoh; the miraculous signs and plagues; the escape of the Hebrew people and the parting of the Red Sea. Then the beginning of the wilderness wanderings. The next mention of Zipporah and her sons is found in Exodus 18:2 where Jethro/Reuel takes Zipporah and her two sons, Gershom and Eleazer, back to Moses at the Mount of God. Did Moses Have a Second Wife? 12 Miriam and Aaron spoke against Moses because of the Cushite woman whom he had married, for he had married a Cushite woman. It is possible that this reference is made regarding Zipporah, but it is equally possible that this relates to a second wife of Moses. we really can’t be sure either way, since the words “Cushite” and “Midian” may be synonymous. Whatever the truth of the matter, the Bible does not record what became of Zipporah, and her and Moses’ sons, Gershom and Eliezer. 01) God would perform miracles to help Moses. 02) God would harden Pharaoh’s heart so that he would experience all God’s power, so that the Egyptians would know that the Lord was the sovereign God who rules all countries and all history (Exodus 7:3-5). Through 5 plagues Pharaoh hardened his own heart (see Exodus 7:13;14,22; 8:15,19,32; 9:7). Then God hardened Pharaoh’s heart (see Exodus 9:12; 10:1,20,27; 11:10; 14:4,8,17). This is an example of the dynamic interplay between human freewill and divine sovereignty. Pharaoh retained the freedom to harden his own heart, refusing to do what God commanded. Behind it all, God showed His control over all participants of history by using Pharaoh to accomplish His purposes and to reveal Himself fully to both His people and the Egyptians. In all this, the just and righteous God do no evil or injustice. Pharaoh remained responsible for his own refusal to co-operate in the divine plan. Through these miraculous signs and wonders, God’s people gained assurance that God is supremely able to accomplish His purposes any way He chooses. God is the ultimate cause of all that occurs because He is the only sovereign God. When Pharaoh refused to let the Hebrew people go free from slavery, God’s judgement destroyed Pharaoh’s first-born son. God is a God of grace, and of judgement. He offers grace to all those who accept Him, and judgement for all those who choose to reject Him. Election is based on God’s parental love.